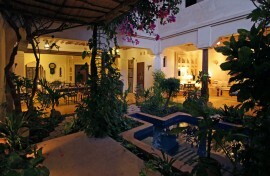 Situated in Lamu, Baytil Ajaib was renovated for 11 years in order to restore its original Swahili design. The house is divided into 5 unique and private apartments. Baytil Ajaib house is very cool due to the mixture of materials used in building that provide a natural air-conditioning. The sweet scent in the air and water comes from the frangipani flowers floating on the traditional pools. 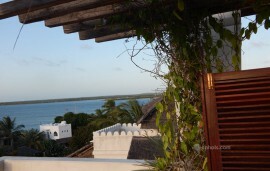 Not to forget the enchanting roof top views from the secret alcoves, terraces and balconies, providing a good view of the Lamu town and the Lamu archipelago. Baytil Ajaib has 5 unique and private apartments. The apartments are divided to 2 double apartments and 2 double suites. All apartments and suites have their own private bathrooms. 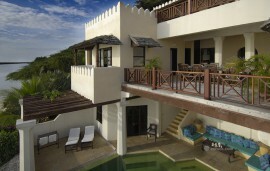 All the rooms are decorated with Swahili furniture and a mixture of African and western art artefacts. 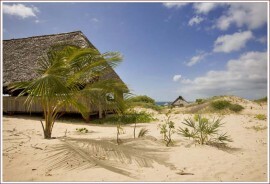 They are also well equipped with bed linen, mosquito nets and house towels. The dining room at Baytil Ajaib is on the ground floor and breakfast is served there or in the apartments depending on the customer’s choice. With verandas/an open courtyard on each floor this charming house is often frequented by birds and butterflies at different time of the day.